As the days get longer and warmer, its easy to forget that winter was only a few weeks ago. Seriously, this was a winter that one will not soon forget with the polar vortex and the larger than life energy bills. One great discovery I made this past winter season was the ice castles “grown” at Loon Mountain ski resort in Loon, NH up the White Mountains. These castles have become an annual event and they are painstakingly grown all season through the use of an icicle farm and drips of water from irragation tubes. It icicles are grown over night and then attached to the ever growning stucture of the ice castle. Sprayers and drippers provide a slow mist of water that freezes to the “seed” icicles and get bigger and bigger to the point that caves and tunnels are formed. Recently the question came up on the Fine Art America forums “How Do You Decide On What To Take Pictures Of? Do you just take random pictures of whatever you see or do you have something in mind?”. Mostly the answers lead towards purposeful undertaking with serendipitous moments along the way. After all, all the planning in the world is never going to turn out completely as planned. One of the more interesting notions that came up was the discussion of props. I myself have driven to locations with props especially for going after book cover shots for my portfolio with Arc Angel Images. Umbrellas, suitcases, hats, chairs, bones, skulls, Christmas presents. All kinds of things accompany me on my photography outings. 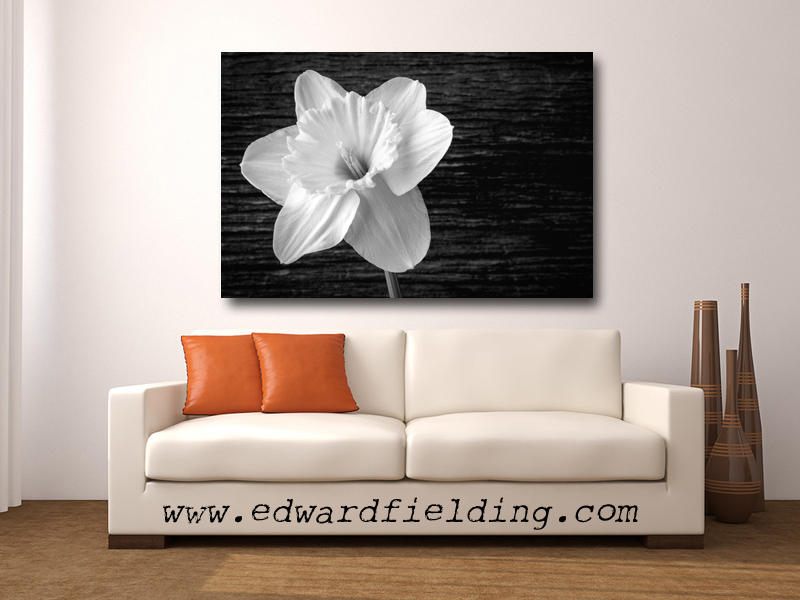 When you are trying to tell a story with your photographs, its a prop that most often can add more depth to a scene. A picture of an old rusty truck tells one story but a child’s stuffed animal on the old seat adds a whole other dimension. My image above of the two starfish holding hands started way before my trip to the beached of Florida. I packed the two starfish knowing that I’d use them in someway to create a “less than boring” beach scene. The idea of the two holding hands didn’t come to me until I was in the process of setting up the shot. If I didn’t have my props with me, I’d have nothing to shoot but an endless beach in Florida. Nothing too earth shattering there. To some the use of props is probably considered to cheat. The rigid straight photography crowd, its probably anything done to alter the “natural” landscape is probably some kind of self-imposed sin but for those looking to tell stories with their photography, props can open up a whole new world of possibilities. Part of the mystic of photography is the ability to manipulate time. Photographs can become time machines, a glimpse of the past here in the present, to be sent on to the future. Photography can stop time cold and allow us to see things that happen in milliseconds, things undetectable by our own vision equipment. 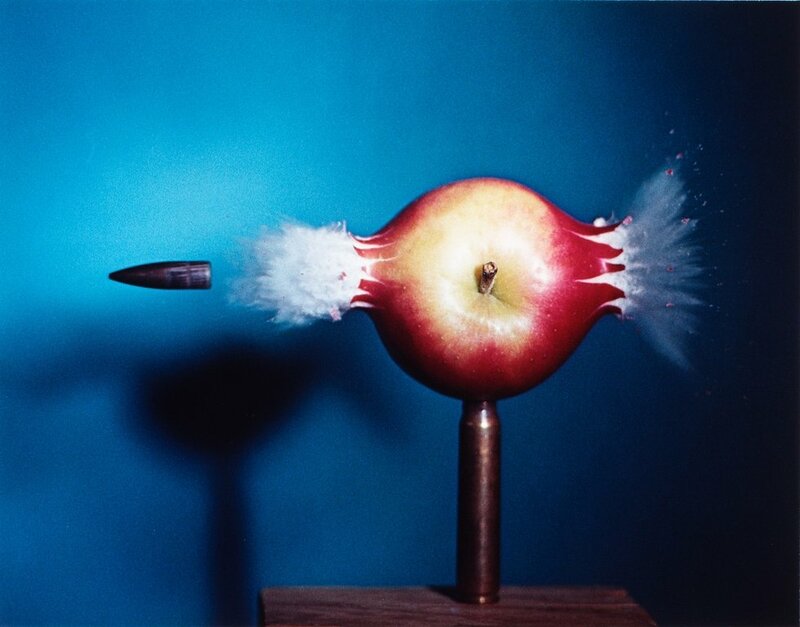 Such as the photographs of Harold Edgerton such as Bullet Piercing an Apple, 1964. Or the motion studies of Eadweard Muybridge, which slowed down time into a sequence of steps to be studies more closing that could ever be with the human eye. Photographers have may tools at their disposal for capturing motion and time in a variety of effects. Fast shutter speeds and strobes can freeze action cold. Slow shutter speeds can imprint a multitude of time on to a single image. Take the flowing photograph of mine into consideration. The slow shutter speed image of people walking on a beach allows the figures to blur across their motion, adding a since of time to the image. This effect can be taken to the extreme with motions blurs that become more abstract art. Here in this motion blur image taken in a tulip garden, time reduces the flowers to pure abstract colors. The meaning perhaps is lost in favor of a perhaps feeling or mood. Camera settings to capture motion blur are not as simple as using a “slower than recommended handheld shutter speed”. The motion blur depends on the speed of the subject. Consider the bullet shot through the apple. A bullet traveling at 896 m/s is going to show blur in just about any conditions unless you have specialized equipment. Consider the movement of the people on the beach – slower by magnitudes and as such the blur can be created with perhaps a 30th of a second. Motion blurs need to be conducted with thought and purpose. Just saying that an out of focus image with camera shake is a “motion blur” rather than poor craftsmanship is simply dishonest. My father-in-law is a fly fishing fanatic. He lives out west in Bozeman, Montana near Yellowstone National and fishes nearly every single day of the year. Fall, Winter, Spring, Summer – he is out there casting his fly and pulling in beautiful rainbows, cutthroats and brookies. Sometime he takes a picture, sometimes he gives them a kiss, but he always carefully releases them back in the wild to be caught another day. He recently showed be an extra special shot of beautiful brookie, lit up in the low, late day western sun. I asked him to send me a copy so I could tweak it a bit and the results can be seen above. I gave it a bit of dynamic contract, knocked out some noise and upped the vibrance a bit. We have a deal going, any proceeds from the sale of this image will be spent on local draft beer when we meet up in Banff this summer. If you would like to contribute to the cause, go ahead and order a card, print or canvas of this beautiful fish. Bob and I will toast your generosity with a cold one! Cards are $6.95 or get a box of 25 for only $1.50 per card. Prints start at $27. There’s been a lot of discussion on the Fine Art America forums about labels, descriptions and even the use of “International Art English” but the bottom line with selling art is about making a connection with the viewer. HOW and WHAT are easy, they deal with the mechanics of the art but it is the WHY that makes a personal connection with the audience. Personal connections lead to sales. The why is the purpose behind the art. Not only is it a good way to let viewers into the artists mind, a bit of behind the scenes type view, but it also is a good exercise for the artist. Are you working with purpose or just flailing around? It is also a journey into discovery as you might see themes and values that you are expressing in your art that you didn’t even realize. So much of art is from the subconscious, by doing a little self assessment of your work and expressing it to others, you’ll probably discover all kinds of motivations behind your work. The “Why” is your reason for existing, the higher cause you believe in, the big problem you want to solve. In the speech he talks about Apple and why they’re different. There are many computer companies, and yet Apple is more successful then all of them. Apple’s “How” is their design and engineering talent. They will challenge the status quo by using amazing designs and prioritizing simple user experience. Their “What” is their products: iPhones, iPads, iMacs, and MacBooks. I just sold another print of my Original Monopoly Board Game Patent. I find it very popular among real estate agents and agencies. I kind of expect to see it in the lobby of the real estate agency the next time I buy or sell property. Certainly is a fun piece for anyone involve in the business of property management or sales. I wonder how many future real estate agents grew up playing the board game. Of course didn’t we all play it growing up? The game has an interesting history. The origins of the game can be traced back to 1903, when an American woman named Elizabeth (Lizzie) J. Magie Phillips created a game through which she hoped to be able to explain the single tax theory of Henry George (it was intended to illustrate the negative aspects of concentrating land in private monopolies). Her game, The Landlord’s Game, was self-published, beginning in 1906. Several people, mostly in the Midwestern United States and near the East Coast, contributed to the game’s design and evolution. But by the 1970s, the idea that the game had been created solely by Charles Darrow had become popular folklore: it was printed in the game’s instructions and even in the 1974 book The Monopoly Book: Strategy and Tactics of the World’s Most Popular Game by Maxine Brady.